A point of information to be gained from the fixation test is the adequacy of gaze holding, as impaired gaze holding may indicate the presence of a central (cerebellar or brainstem) lesion. Causes of gaze-evoked nystagmus are listed in the table above. There are several distinct patterns which can be identified by close scrutiny of the eye position trace. (Note that we didn't say that you can get this by reading the computerized ENG report - -commercial ENG computers don't understand GEN). The most common variety consists of a drift towards the center of the orbit, interspersed by corrective outgoing saccades attempting to acquire a target which has drifted off the fovea. In this situation, the initial rate at which the eye drifts is directly proportional to how far the eye is from center, because elastic restoring forces are proportional to displacement. Accordingly, as the eye approaches center, the rate of drift decreases, accounting for the characteristic decreasing exponential trajectory of ocular drift. The decreasing exponential pattern may be difficult to appreciate if the patient makes frequent saccades to the target, and one must look for a slow phase in which the patient allowed his eye to drift close to the center. Gaze-evoked nystagmus on lateral gaze and upward gaze is common while gaze-evoked nystagmus on downward gaze is infrequent. Certain patients with congenital nystagmus or with acquired central nystagmus varieties have increasing exponential velocity patterns. There are several factors which contribute to the amount of GEN. The first relates to the patterns of neural firing associated with maintenance of eye position against elastic restoring forces. Central disorders, particularly those involving the cerebellum, can disrupt the neural "step" of firing, and cause centripetal drift. A second consideration relates to how proficiently the patient can use visual tracking mechanisms such as pursuit or optokinetic responses to offset and eliminate drift, even though it is self-generated. A third factor relates to the frequency with which the patient develops corrective saccades. Because these factors are normally not controlled for, the judgment of that a patient has an abnormal amount of GEN is usually a qualitative one, based on the observation that the patient has nystagmus on gaze in one direction, but none in the other, or nystagmus for unusually small displacements from center. GEN is an extremely common consequence of medication, especially sedatives or anticonvulsants. Gaze-evoked nystagmus which is of greater when looking in one direction than the other occurs in several situations. In vestibular disorders, when gaze-evoked nystagmus is combined with a spontaneous nystagmus, they add when gazing towards the fast phase of the spontaneous nystagmus and subtract in the opposite direction. This often results in the pattern of a greater overall nystagmus when gazing towards the fast-phase direction of the spontaneous nystagmus. This common clinical pattern is called "Alexander's law" (Robinson et al, 1984), and occurs in patients with peripheral and in some patients with central vestibular imbalance. Brun's nystagmus, which occurs in patients with cerebellar lesions, refers to asymmetrical nystagmus in which there is little or no spontaneous nystagmus in primary position, but an asymmetry exists at the extremes of lateral gaze. Patients with internuclear ophthalmoplegia (INO) often exhibit a discongugate gaze-evoked nystagmus in which the abducting eye exhibits a more prominent nystagmus than the adducting eye. Certain patients with congenital nystagmus or with rare acquired central nystagmus varieties have "increasing exponential" velocity patterns. These waveforms are generally easy to spot because are so vigorous. Persons with CN generally have less nystagmus in the dark as well as nystagmus in central gaze. Patients with a saccadic disorder called internuclear ophthalmoplegia (INO) often exhibit a discongugate GEN in which the abducting eye exhibits a more prominent amplitude nystagmus than the adducting eye. This record was obtained in a young woman from a family with a familial cerebellar degeneration. The velocity of downbeating nystagmus increases to an astounding 33 deg/second on right lateral gaze. 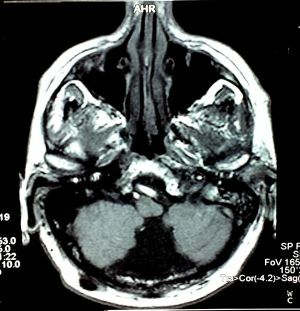 This pattern of DBN increased by lateral gaze suggests a cerebellar disorder, with the main suspects being paraneoplastic cerebellar degeneration, a Chiari Malformation, or other cerebellar disorder (such as was the case here). This patient also has a left-beating spontanous nystagmus. If this patient didn't have a family history.